Image: studiogstock/Getty Images. Design: Ashley Britton/SheKnows. Disneyland is, without a doubt, the most magical place on Earth. So why wouldn’t you want to sprinkle a bit of that magic on one of the most memorable days of your life: your wedding day. 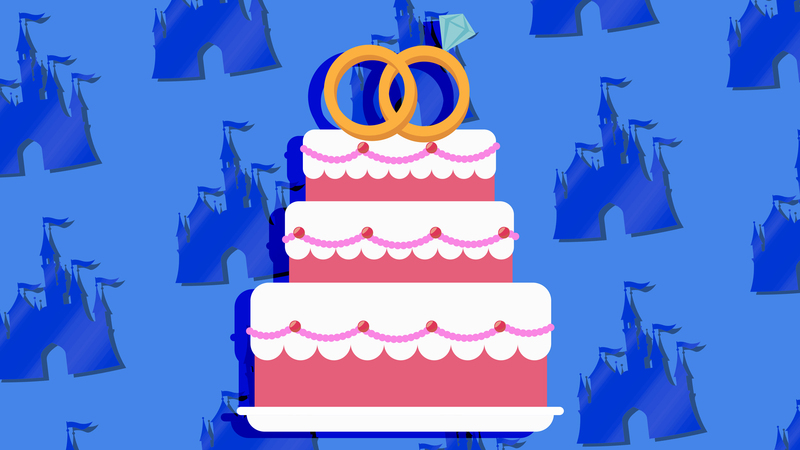 For those of us who can’t afford to splurge on having our wedding at Disneyland or Disney World, where we’ll soon be able to down a few alcoholic beverages at the amusement park this year for the very first time ever, the next best thing is an over-the-top Disney-themed wedding cake. And luckily for us all, we have plenty of Disney-inspired wedding cake inspo to gawk at and pin for later. From gold-hued, rose-detailed, multitiered cakes à la Beauty and the Beast to an extravagant, intricately designed Cinderella-themed castle and everything in between, feast your eyes on the 18 most magical wedding cakes we’ve ever seen. We’d be pretty hesitant to cut into this incredibly detailed castle inspired by Cinderella. It’s a work of art. For a cake that’s less in your face, Disney’s Fairy Tale Weddings created this Cinderella-themed cake that’s good as gold. Serve a piece of Disney World to all your guests. It’s hard not to live happily ever after when this is your wedding cake. The roses are an elegant touch. The lantern details really make this Tangled-inspired cake pop. Want more color? England-based Peri Bakes has an incredible three-layer cake that combines Tangled, Cinderella and The Princess and the Frog. Flashback to one of my favorite cakes of the year: the hand-painted 360 degree, iconic scene from Tangled. It looks like it’s glowing from within! One look at this hand-painted cake, and you’ll have “I See the Light” stuck in your head. This cake may look delicious on the outside, but inside, it’s a whole ‘nother story: The bottom layer is a lemon cake with raspberry filling; the middle layer is red velvet; and the top layer is a chocolate cake with hazelnut filling. Behold, the cake topper to end all cake toppers. This stained-glass design is downright gorgeous. This understated cake by U.K.-based Rachel Hudson Cakes is simple yet playful. This one is a black-and-white beauty. Aladdin and Jasmine would approve of this silhouette cake. With teacups, a pocket watch and the Mad Hatter’s hat, this Alice in Wonderland cake would complement any whimsical wedding. Spin this Little Mermaid wedding cake around and you’ll reveal two distinctive designs: a beach scene on one side and Ariel and Eric embracing on the other. Disney princesses — Snow White, Sleeping Beauty, Belle and Elsa — unite with this multilayered wedding cake. If Peter Pan, Beauty and the Beast, The Little Mermaid and The Lion King are four of your favorite Disney movies, this cake is calling your name.